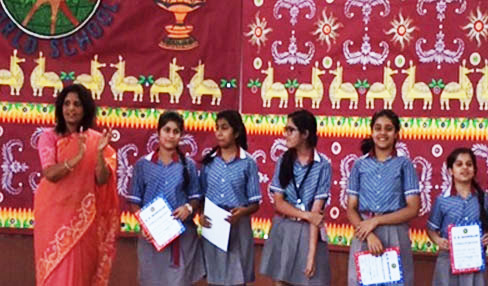 The Continuous and Comprehensive Evaluation System is a method whereby the students are given an opportunity to bud and blossom in a friendly environment and get ample scope to hone their talents in myriad fields It is a platform where the learner is assessed through scholastic and co-scholastic domains of development. It provides a paradigm shift from examination to education. The term Continuous refers to proper diagnosis of the gaps in the learning process and enables teachers to take accurate remedial measures to set the problem right- assessment and remedial measures are not restricted to term end exams but are an ongoing process. The term Comprehensive refers to the scholastic and co-scholastic areas of assessment throughout the learning process. The main aim at this level is to provide in depth knowledge of the concepts. An extensive use of technology supplements classroom teaching thereby making it interactive and thus enhancing comprehension. Homework given to students is a stimulating revision exercise generally in the form of worksheets. A lot of stress is laid at this stage on spoken English with emphasis on good pronunciation and diction coupled with excellent reading and writing skills. Educational trips and excursions are organized on a regular basis to make learning fun and meaningful. The curriculum at middle school aims to allow students to think intensively and critically.